Muscle wasting and fatigue contribute to the morbidity and mortality experienced by individuals undergoing hemodialysis and by those infected with human immunodeficiency virus (HIV). Johansen and colleaguesArticle report that patients undergoing hemodialysis with evidence of malnutrition or poor quality of life who were treated for 6 months with weekly injections of the anabolic steroid nandrolone decanoate had significantly greater increases in lean body mass and improvements in functional capacity than patients who received placebo. In an 8-week study of eugonadal men infected with HIV who had prior weight loss, Strawford and coworkersArticle found that increases in nitrogen retention, lean body mass, and strength were greater among subjects treated with the anabolic steroid oxandrolone along with a physiologic replacement dose of testosterone and progressive resistance exercise compared with subjects treated with testosterone and exercise alone. In an editorial, DobsArticle points out that adequate energy intake and resistance exercise are baseline interventions for patients with decreased lean body mass secondary to chronic disease and that more research is needed to define the role of anabolic steroids. Individuals with diabetes have not experienced the same recent declines in heart disease mortality as individuals without diabetes. Gu and colleagues determined mortality rates in nationally representative adult cohorts during 2 periods, 1971 through 1975 and 1982 through 1984. Each cohort was followed up for 8 to 9 years. Age-adjusted heart disease mortality decreased more between the 2 periods for men without diabetes (36.4%) than for men with diabetes (13.1%). Age-adjusted mortality declined 27% for women without diabetes but increased 23% for women with diabetes. Measures of health-related quality of life may be a useful and noninvasive clinical tool for the assessment of risk prior to coronary artery bypass graft (CABG) surgery. In a multicenter Veterans Affairs prospective study, Rumsfeld and coworkers found that the preoperative Physical Component Summary score on the self-administered Short Form 36 health status survey was a significant independent predictor of all-cause 6-month mortality following CABG surgery. Smyth and colleaguesArticle report that patients with asthma or rheumatoid arthritis who wrote about the most stressful experience in their life for 20 minutes on 3 consecutive days had significantly greater reductions in symptoms 4 months after the intervention than patients in the control group who wrote about their daily plans. In an editorial, SpiegelArticle summarizes the recent literature on the relationship between stress and health outcomes. 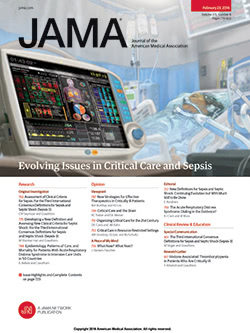 Using patient outcome data from the Maryland Uniform Health Discharge Data Set and survey data from intensive care unit (ICU) medical directors, Pronovost and coworkersArticle found that daily rounds with an ICU physician were associated with a 3-fold decrease in in-hospital mortality after abdominal aortic surgery. Organizational features and processes of care associated with increased ICU length of stay and/or hospital length of stay included no daily rounds with an ICU physician, ICU nurse-to-patient ratio of less than 1:2, no monthly review of morbidity and mortality, and extubation of patients in the operating room. In an editorial, RandolphArticle comments that certain ICU organizational changes anticipated to decrease costs may actually increase costs if adverse patient outcomes result in increased resource utilization. Helical computed tomography offers innovative imaging possibilities, such as virtual colonoscopy for the noninvasive detection of colorectal polyps (Figure 1). Use of low-dose oral contraceptives does not appear to increase stroke risk, but more information is needed on women with coexisting risk factors for stroke. A preview of 2 new traveling exhibitions: "The Changing Face of Women's Health" at Baltimore's Maryland Science Center and "Breath of Life" at the National Library of Medicine in Bethesda. Which drugs are effective for the treatment of alcohol dependence? A systematic review of the literature. A recent outbreak of type A botulism in Argentina prompts the development of a centralized antitoxin release and botulism surveillance system. For your patients: A primer on problem drinking and alcoholism.